Barbara Davis Keyte was the widow of George Keyte. She lived at 1872 Georgia Street in 1912. Barbara was born Barbara Davis Cleet in 1874 in South Shields, England. Her father was Thomas Davis Cleet (1845-1926), who was a shipwright. Barbara’s mother was Mary Elliot (1848-1908). Although Thomas Cleet lived in many houses during his life, in 1921 he was living at 89 Osborne Avenue in South Shields. 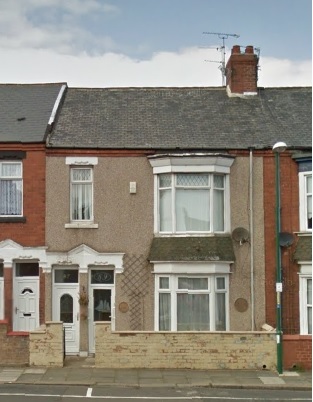 89 Osborne Avenue, South Shields, England, Google streets, searched October 2, 2016, image dated August 2012. On July 31, 1900, in South Shields, Barbara married George Keyte, an engineer who was born in Gibraltar on February 4, 1871. His parents were George and Marion Keyte. George senior, was a surveyor and engineer. George junior studied at St. George’s School in Ramsgate, and at Durham University College of Science (later Newcastle University) in Newcastle-on-Tyne. After a five-year apprenticeship, George became an assistant engineer at the Ramsgate Gas and Water Works. In 1895 he became the superintendent of Shields Works and assistant engineer with the South Shields Gas Company. In 1901 he became the manager of the Workington Corporation Gas Works. Workington’s Gas Manager, Manchester Courier and Lancashire General Advertiser (Manchester, England), issue 13820, February 23, 1901; page 6. 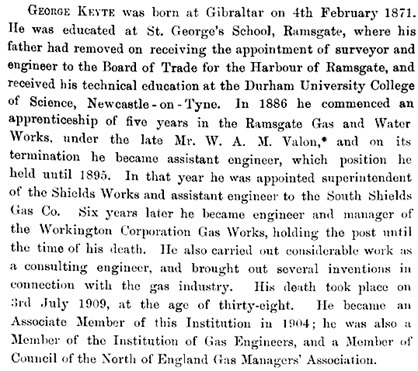 George continued his employment with the Workington’s Gas Works until he died in Cockermouth, near Workington, on July 3, 1909. 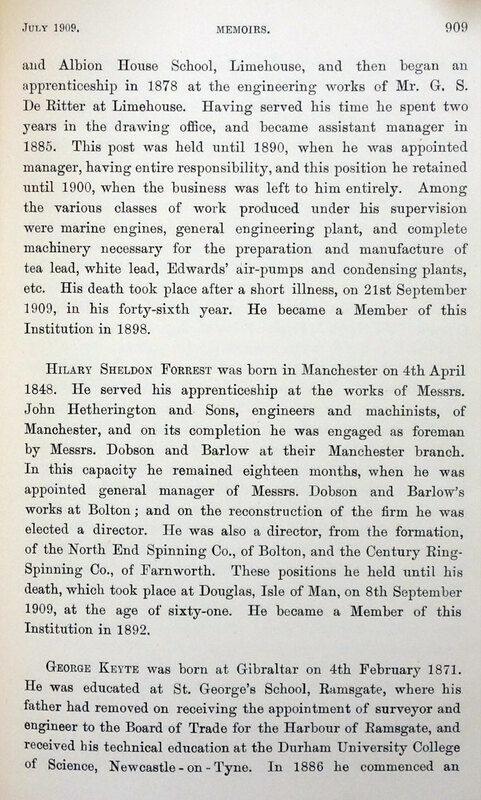 The Institution of Mechanical Engineers published his obituary. Barbara stayed in Vancouver only for a year or so, although it is not clear where she went afterwards. In 1921 Barbara was a passenger on the Mauretania, which sailed from Southampton, England, to New York City. She was going to stay with her friend, Mrs. Tulney, who lived at 77 Main Street in Orange, New Jersey. By 1930, Barbara was living at 18 West 11th Street in Greenwich Village in New York City. She was a children’s nurse with the family of Charles Edward Merrill (1885-1956). Mr. Merrill was the co-founder of Merrill Lynch, the American banking and investment firm. One of the Merrill children was James Merrill (1926-1995), who became a well-known American poet. Many years later, the house at 18 West 11th was in the news. The Merrill family had left the house in the 1930s. James Wilkerson bought it in 1963. His daughter, Cathlyn Wilkerson, became involved with the Weathermen, a militant revolutionary group. In 1970, members of the Weathermen were preparing a nail bomb in the basement of the house. The bomb exploded prematurely, destroying the entire house, killing three people, and injuring Cathlyn and another person. In 1934, Barbara had been in England when she sailed to New York. She was still working as a nurse. It appears that Barbara died in South Shields in 1950. “England Births and Christenings, 1538-1975,” database, FamilySearch (https://familysearch.org/ark:/61903/1:1:NJ4M-VL4 : 30 December 2014), Thomas Davis Cleet, 05 Nov 1845; citing , reference item 6 p 110; FHL microfilm 1,894,144. “England and Wales Birth Registration Index, 1837-2008,” database, FamilySearch (https://familysearch.org/ark:/61903/1:1:26GZ-BTW : 1 October 2014), Thomas Davis Cleet, 1845; from “England & Wales Births, 1837-2006,” database, findmypast (http://www.findmypast.com : 2012); citing Birth Registration, South Shields, Durham, England, citing General Register Office, Southport, England. “England and Wales Census, 1851,” database with images, FamilySearch (https://familysearch.org/ark:/61903/1:1:SGVS-YGY : 24 July 2016), Thomas D Cleet in household of James Cleet, , Durham, England; citing , Durham, England, p. 35, from “1851 England, Scotland and Wales census,” database and images, findmypast (http://www.findmypast.com : n.d.); citing PRO HO 107, The National Archives of the UK, Kew, Surrey. “England and Wales Census, 1871”, database with images, FamilySearch (https://familysearch.org/ark:/61903/1:1:VB8J-GYX : 22 July 2015), Thomas Davis* Cleat, 1871. “England and Wales Marriage Registration Index, 1837-2005,” database, FamilySearch (https://familysearch.org/ark:/61903/1:1:2DLM-M1F : 13 December 2014), Thomas Davis Cleet, 1871; from “England & Wales Marriages, 1837-2005,” database, findmypast (http://www.findmypast.com : 2012); citing 1871, quarter 4, vol. 10A, p. 1006, South Shields, Durham, England, General Register Office, Southport, England. “England and Wales Census, 1881,” database with images, FamilySearch (https://familysearch.org/ark:/61903/1:1:Q271-2RTV : 19 August 2016), Thomas Davis Cleet, South Shields, Durham, England; from “1881 England, Scotland and Wales census,” database and images, findmypast (http://www.findmypast.com : n.d.); citing p. 16, Piece/Folio 5020/85, The National Archives, Kew, Surrey; FHL microfilm 101,775,390. “England and Wales Census, 1891,” database with images, FamilySearch (https://familysearch.org/ark:/61903/1:1:WKQ5-53Z : 15 October 2015), Thomas Davis Cleet, South Shields, Durham, England; from “1891 England, Scotland and Wales census,” database and images, findmypast (http://www.findmypast.com : n.d.); citing PRO RG 12, Durham county, subdistrict, The National Archives of the UK, Kew, Surrey. “England and Wales Census, 1901,” database, FamilySearch (https://familysearch.org/ark:/61903/1:1:XSCD-NZQ : 29 August 2015), Thomas D Cleet, South Shields, Durham, England; from “1901 England, Scotland and Wales census,” database and images, findmypast (http://www.findmypast.com : n.d.); citing South Shields subdistrict, PRO RG 13, The National Archives, Kew, Surrey. “England and Wales Census, 1911,” database, FamilySearch (https://familysearch.org/ark:/61903/1:1:XWC8-NK1 : 20 January 2015), Thomas Cleet, South Shields, South Shields, Durham, England; from “1911 England and Wales census,” database and images, findmypast (http://www.findmypast.com : n.d.); citing PRO RG 14, The National Archives of the UK, Kew, Surrey. “England and Wales Death Registration Index 1837-2007,” database, FamilySearch (https://familysearch.org/ark:/61903/1:1:QVHC-LTGF : 4 September 2014), Thomas D Cleet, 1926; from “England & Wales Deaths, 1837-2006,” database, findmypast (http://www.findmypast.com : 2012); citing Death, South Shields, Durham, England, General Register Office, Southport, England. “England and Wales Marriage Registration Index, 1837-2005,” database, FamilySearch (https://familysearch.org/ark:/61903/1:1:2DLM-XZ7 : 13 December 2014), Mary Elliott, 1871; from “England & Wales Marriages, 1837-2005,” database, findmypast (http://www.findmypast.com : 2012); citing 1871, quarter 4, vol. 10A, p. 1006, South Shields, Durham, England, General Register Office, Southport, England. “England and Wales Census, 1881,” database with images, FamilySearch (https://familysearch.org/ark:/61903/1:1:Q271-2RYC : 19 August 2016), Mary Cleet in household of Thomas Davis Cleet, South Shields, Durham, England; from “1881 England, Scotland and Wales census,” database and images, findmypast (http://www.findmypast.com : n.d.); citing p. 16, Piece/Folio 5020/85, The National Archives, Kew, Surrey; FHL microfilm 101,775,390. “England and Wales Census, 1891,” database with images, FamilySearch (https://familysearch.org/ark:/61903/1:1:WKQR-S3Z : 15 October 2015), Mary Elliot Cleet in household of Thomas Davis Cleet, South Shields, Durham, England; from “1891 England, Scotland and Wales census,” database and images, findmypast (http://www.findmypast.com : n.d.); citing PRO RG 12, Durham county, subdistrict, The National Archives of the UK, Kew, Surrey. “England and Wales Census, 1901,” database, FamilySearch (https://familysearch.org/ark:/61903/1:1:XSCD-NZ7 : 29 August 2015), Mary E Cleet in household of Thomas D Cleet, South Shields, Durham, England; from “1901 England, Scotland and Wales census,” database and images, findmypast (http://www.findmypast.com : n.d.); citing South Shields subdistrict, PRO RG 13, The National Archives, Kew, Surrey. “England and Wales Death Registration Index 1837-2007,” database, FamilySearch (https://familysearch.org/ark:/61903/1:1:2JSH-N9P : 31 December 2014), Mary Elliott Cleet, 1908; from “England & Wales Deaths, 1837-2006,” database, findmypast (http://www.findmypast.com : 2012); citing Death, South Shields, Durham, England, General Register Office, Southport, England. “England Births and Christenings, 1538-1975,” database, FamilySearch (https://familysearch.org/ark:/61903/1:1:NJHD-WMH : 30 December 2014), Barbara Davis Cleet, 02 Aug 1874; citing Stockton-on-Tees, Durham, England, reference item 3 p 292; FHL microfilm 1,894,478. “England Births and Christenings, 1538-1975,” database, FamilySearch (https://familysearch.org/ark:/61903/1:1:JS1W-SVS : 6 December 2014), Barbara Davis Cleet, 02 Aug 1874; citing , reference ; FHL microfilm 1,894,184. “England Births and Christenings, 1538-1975,” database, FamilySearch (https://familysearch.org/ark:/61903/1:1:JQ4R-MXG : 30 December 2014), Barbara Davis Cleet, 02 Aug 1874; citing , reference yr 1857-1905 p 292; FHL microfilm 1,894,184. “England and Wales Birth Registration Index, 1837-2008,” database, FamilySearch (https://familysearch.org/ark:/61903/1:1:2XZJ-3LT : 1 October 2014), Barbara Davis Cleet, 1874; from “England & Wales Births, 1837-2006,” database, findmypast (http://www.findmypast.com : 2012); citing Birth Registration, South Shields, Durham, England, citing General Register Office, Southport, England. “England and Wales Census, 1881,” database with images, FamilySearch (https://familysearch.org/ark:/61903/1:1:Q271-2RBW : 19 August 2016), Barbara Cleet in household of Thomas Davis Cleet, South Shields, Durham, England; from “1881 England, Scotland and Wales census,” database and images, findmypast (http://www.findmypast.com : n.d.); citing p. 16, Piece/Folio 5020/85, The National Archives, Kew, Surrey; FHL microfilm 101,775,390. “England and Wales Census, 1891,” database with images, FamilySearch (https://familysearch.org/ark:/61903/1:1:WKQR-WN2 : 15 October 2015), Barbara Davis Cleet in household of Thomas Davis Cleet, South Shields, Durham, England; from “1891 England, Scotland and Wales census,” database and images, findmypast (http://www.findmypast.com : n.d.); citing PRO RG 12, Durham county, subdistrict, The National Archives of the UK, Kew, Surrey. “England Marriages, 1538–1973 ,” database, FamilySearch (https://familysearch.org/ark:/61903/1:1:NNVF-8CZ : 10 December 2014), George Keyte and Barbara Davis Cleet, 31 Jul 1900; citing South Shields, Durham, England, reference P-120-240; FHL microfilm 1,894,186. “England and Wales Marriage Registration Index, 1837-2005,” database, FamilySearch (https://familysearch.org/ark:/61903/1:1:26SF-M3M : 22 May 2014), Barbara Davis Cleet, 1900; from “England & Wales Marriages, 1837-2005,” database, findmypast (http://www.findmypast.com : 2012); citing 1900, quarter 3, vol. 10A, p. 1267, South Shields, Durham, England, General Register Office, Southport, England. “England and Wales Census, 1901,” database, FamilySearch (https://familysearch.org/ark:/61903/1:1:XSCP-HFP : 29 August 2015), Barbara Keyte in household of George Keyte, South Shields, Durham, England; from “1901 England, Scotland and Wales census,” database and images, findmypast (http://www.findmypast.com : n.d.); citing South Shields subdistrict, PRO RG 13, The National Archives, Kew, Surrey. “England and Wales Census, 1911,” database, FamilySearch (https://familysearch.org/ark:/61903/1:1:XWC8-NZY : 20 January 2015), Barbara Keyte, South Shields, South Shields, Durham, England; from “1911 England and Wales census,” database and images, findmypast (http://www.findmypast.com : n.d.); citing PRO RG 14, The National Archives of the UK, Kew, Surrey. “Recensement du Canada de 1911,” database, FamilySearch (https://familysearch.org/ark:/61903/1:1:QV95-M26H : 2 March 2015), Barbar Keyte, 1911; citing Census, Vancouver Sub-Districts 1-18, British Columbia, Canada, Library and Archives of Canada, Ottawa, Ontario; FHL microfilm 2,417,661. “New York Passenger Arrival Lists (Ellis Island), 1892-1924,” database, FamilySearch (https://familysearch.org/ark:/61903/1:1:J6PS-BP1 : 6 December 2014), Babara Keyte, 07 May 1921; citing departure port Southampton, arrival port New York, ship name Mauretania, NARA microfilm publication T715 and M237 (Washington D.C.: National Archives and Records Administration, n.d.). “United States Census, 1930”, database with images, FamilySearch (https://familysearch.org/ark:/61903/1:1:X423-3PD : 8 December 2015), Barbara Keyte in entry for Charles E Merrill, 1930. “New York, New York Passenger and Crew Lists, 1909, 1925-1957,” database with images, FamilySearch (https://familysearch.org/ark:/61903/1:1:24NY-FXX : 2 October 2015), Barbara Keyte, 1934; citing Immigration, New York, New York, United States, NARA microfilm publication T715 (Washington, D.C.: National Archives and Records Administration, n.d.). “England and Wales Death Registration Index 1837-2007,” database, FamilySearch (https://familysearch.org/ark:/61903/1:1:QVCX-M7LZ : 4 September 2014), Barbara Keyte, 1950; from “England & Wales Deaths, 1837-2006,” database, findmypast (http://www.findmypast.com : 2012); citing Death, South Shields, Durham, England, General Register Office, Southport, England. The Day Dustin Hoffman’s House Blew Up; http://mrbellersneighborhood.com/2001/01/the-day-dustin-hoffmans-house-blew-up [includes photographs of the neighbourhood before and after the explosion]. “England and Wales Census, 1881,” database with images, FamilySearch (https://familysearch.org/ark:/61903/1:1:Q27W-KPPB : 18 August 2016), George Keyte, Ramsgate, Kent, England; from “1881 England, Scotland and Wales census,” database and images, findmypast (http://www.findmypast.com : n.d.); citing p. 28, Piece/Folio 989/96, The National Archives, Kew, Surrey; FHL microfilm 101,774,449. “England and Wales Marriage Registration Index, 1837-2005,” database, FamilySearch (https://familysearch.org/ark:/61903/1:1:2DTL-S6T : 13 December 2014), George Keyte, 1882; from “England & Wales Marriages, 1837-2005,” database, findmypast (http://www.findmypast.com : 2012); citing 1882, quarter 4, vol. 1A, p. 336, Kensington, London, England, General Register Office, Southport, England. “England and Wales Census, 1891,” database with images, FamilySearch (https://familysearch.org/ark:/61903/1:1:Q29G-2ZM : 15 October 2015), George Keyte, Ramsgate, Kent, England; from “1891 England, Scotland and Wales census,” database and images, findmypast (http://www.findmypast.com : n.d.); citing PRO RG 12, Kent county, subdistrict, The National Archives of the UK, Kew, Surrey. “England and Wales Death Registration Index 1837-2007,” database, FamilySearch (https://familysearch.org/ark:/61903/1:1:2NRS-9WJ : 31 December 2014), George Keyte, 1911; from “England & Wales Deaths, 1837-2006,” database, findmypast (http://www.findmypast.com : 2012); citing Death, Thanet, Kent, England, General Register Office, Southport, England. “England and Wales Census, 1881,” database with images, FamilySearch (https://familysearch.org/ark:/61903/1:1:Q27W-KPRW : 18 August 2016), Marion Keyte in household of George Keyte, Ramsgate, Kent, England; from “1881 England, Scotland and Wales census,” database and images, findmypast (http://www.findmypast.com : n.d.); citing p. 28, Piece/Folio 989/96, The National Archives, Kew, Surrey; FHL microfilm 101,774,449. “England and Wales Death Registration Index 1837-2007,” database, FamilySearch (https://familysearch.org/ark:/61903/1:1:2JD2-G89 : 31 December 2014), Marion Keyte, 1881; from “England & Wales Deaths, 1837-2006,” database, findmypast (http://www.findmypast.com : 2012); citing Death, Thanet, Kent, England, General Register Office, Southport, England. “England Births and Christenings, 1538-1975,” database, FamilySearch (https://familysearch.org/ark:/61903/1:1:NTLY-3PX : 30 December 2014), Sophia Matilda Shipple Buttress, 25 Feb 1852; citing Kent, England, reference item 1 p 286; FHL microfilm 1,786,328. “England Births and Christenings, 1538-1975,” database, FamilySearch (https://familysearch.org/ark:/61903/1:1:JQKN-LY3 : 6 December 2014), Sophia Matilda Shipple Buttress, 25 Feb 1852; citing Deal, Kent, , England, reference ; FHL microfilm 1,786,328. “England and Wales Birth Registration Index, 1837-2008,” database, FamilySearch (https://familysearch.org/ark:/61903/1:1:2N7W-CJM : 1 October 2014), Sophia Matilda Stapple Buttress, 1852; from “England & Wales Births, 1837-2006,” database, findmypast (http://www.findmypast.com : 2012); citing Birth Registration, Eastry, Kent, England, citing General Register Office, Southport, England. “England Births and Christenings, 1538-1975,” database, FamilySearch (https://familysearch.org/ark:/61903/1:1:JWQ9-V2G : 6 December 2014), Sophia Matilda Shipple Buttress, 25 Feb 1852; citing Deal, Kent, England, reference ; FHL microfilm 1,786,328. “England and Wales Census, 1881,” database with images, FamilySearch (https://familysearch.org/ark:/61903/1:1:QK65-WMXF : 18 August 2016), Sophia Buttress in household of Sophia B Harrison, Kensington, London,Middlesex, England; from “1881 England, Scotland and Wales census,” database and images, findmypast (http://www.findmypast.com : n.d.); citing p. 23, Piece/Folio 46/122, The National Archives, Kew, Surrey; FHL microfilm 101,774,323. “England and Wales Marriage Registration Index, 1837-2005,” database, FamilySearch (https://familysearch.org/ark:/61903/1:1:2DTK-8ZW : 13 December 2014), Sophia Matilda S Buttress, 1882; from “England & Wales Marriages, 1837-2005,” database, findmypast (http://www.findmypast.com : 2012); citing 1882, quarter 4, vol. 1A, p. 336, Kensington, London, England, General Register Office, Southport, England. “England and Wales Census, 1891,” database with images, FamilySearch (https://familysearch.org/ark:/61903/1:1:Q29G-RMM : 15 October 2015), Sophia M S Keyte in household of George Keyte, Ramsgate, Kent, England; from “1891 England, Scotland and Wales census,” database and images, findmypast (http://www.findmypast.com : n.d.); citing PRO RG 12, Kent county, subdistrict, The National Archives of the UK, Kew, Surrey. “England and Wales Death Registration Index 1837-2007,” database, FamilySearch (https://familysearch.org/ark:/61903/1:1:2JB2-G47 : 31 December 2014), Sophia Matilda S Keyte, 1896; from “England & Wales Deaths, 1837-2006,” database, findmypast (http://www.findmypast.com : 2012); citing Death, Thanet, Kent, England, General Register Office, Southport, England. “England and Wales Census, 1891,” database with images, FamilySearch (https://familysearch.org/ark:/61903/1:1:Q29G-BW2 : 15 October 2015), George Keyte in household of George Keyte, Ramsgate, Kent, England; from “1891 England, Scotland and Wales census,” database and images, findmypast (http://www.findmypast.com : n.d.); citing PRO RG 12, Kent county, subdistrict, The National Archives of the UK, Kew, Surrey. “England Marriages, 1538–1973 ,” database, FamilySearch (https://familysearch.org/ark:/61903/1:1:NNVF-8C6 : 10 December 2014), George Keyte in entry for George Keyte and Barbara Davis Cleet, 31 Jul 1900; citing South Shields, Durham, England, reference P-120-240; FHL microfilm 1,894,186. “England and Wales Marriage Registration Index, 1837-2005,” database, FamilySearch (https://familysearch.org/ark:/61903/1:1:26SN-PMX : 13 December 2014), George Keyte, 1900; from “England & Wales Marriages, 1837-2005,” database, findmypast (http://www.findmypast.com : 2012); citing 1900, quarter 3, vol. 10A, p. 1267, South Shields, Durham, England, General Register Office, Southport, England. “England and Wales Census, 1901,” database, FamilySearch (https://familysearch.org/ark:/61903/1:1:XSCP-HFG : 29 August 2015), George Keyte, South Shields, Durham, England; from “1901 England, Scotland and Wales census,” database and images, findmypast (http://www.findmypast.com : n.d.); citing South Shields subdistrict, PRO RG 13, The National Archives, Kew, Surrey. “England and Wales Death Registration Index 1837-2007,” database, FamilySearch (https://familysearch.org/ark:/61903/1:1:2J7S-XF6 : 31 December 2014), George Keyte, 1909; from “England & Wales Deaths, 1837-2006,” database, findmypast (http://www.findmypast.com : 2012); citing Death, Cockermouth, Cumberland, England, General Register Office, Southport, England. GEORGE KEYTE was born at Gibraltar on 4th February 1871. He was educated at St. George’s School, Ramsgate, where his father had removed on receiving the appointment of surveyor and engineer to the Board of Trade for the Harbour of Ramsgate, and received his technical education at the Durham University College of Science, Newcastle-on-Tyne. In 1886 he commenced an apprenticeship of five years in the Ramsgate Gas and Water Works, under the late Mr. W. A. M. Valon, and on its termination he became assistant engineer, which position he held until 1895. 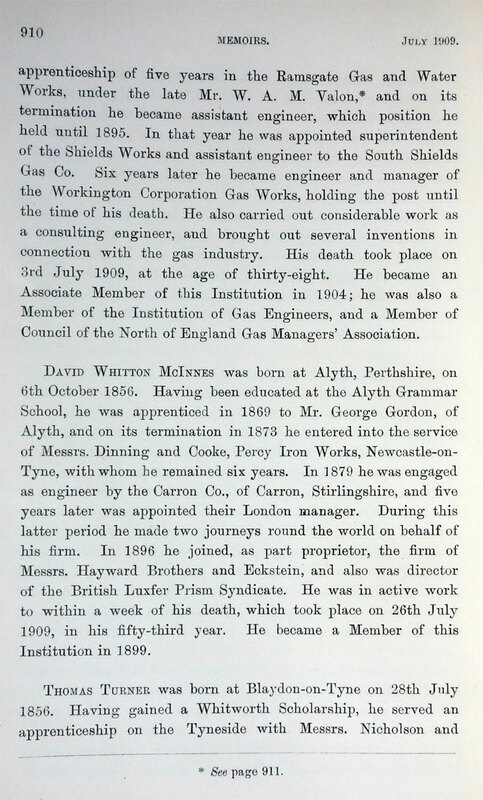 In that year he was appointed superintendent of the Shields Works and assistant engineer to the South Shields Gas Co.
Six years later he became engineer and manager of the Workington Corporation Gas Works, holding the post until the time of his death. He also carried out considerable work as a consulting engineer, and brought out several inventions in connection with the gas industry. His death took place on 3rd July 1909, at the age of thirty-eight. “England Births and Christenings, 1538-1975,” database, FamilySearch (https://familysearch.org/ark:/61903/1:1:NJ4K-QX6 : 30 December 2014), David Stonehouse Cleet, 18 May 1884; citing , reference yr 1857-1905 p 6; FHL microfilm 1,894,184. “England and Wales Census, 1891,” database with images, FamilySearch (https://familysearch.org/ark:/61903/1:1:WKQT-NW2 : 15 October 2015), David Stonehouse Cleet in household of Thomas Davis Cleet, South Shields, Durham, England; from “1891 England, Scotland and Wales census,” database and images, findmypast (http://www.findmypast.com : n.d.); citing PRO RG 12, Durham county, subdistrict, The National Archives of the UK, Kew, Surrey. “England and Wales Census, 1901,” database, FamilySearch (https://familysearch.org/ark:/61903/1:1:XSCD-NZZ : 29 August 2015), David S Cleet in household of Thomas D Cleet, South Shields, Durham, England; from “1901 England, Scotland and Wales census,” database and images, findmypast (http://www.findmypast.com : n.d.); citing South Shields subdistrict, PRO RG 13, The National Archives, Kew, Surrey. “Canada Passenger Lists, 1881-1922,” database with images, FamilySearch (https://familysearch.org/ark:/61903/1:1:2H2T-FR7 : 27 December 2014), David Stonehouse Cleet, Jun 1910; citing Immigration, Quebec City, Quebec, Canada, T-4767, Library and Archives Canada, Ottawa, Ontario. “Recensement du Canada de 1911,” database, FamilySearch (https://familysearch.org/ark:/61903/1:1:QV95-M26X : 2 March 2015), David Cleet in entry for Barbar Keyte, 1911; citing Census, Vancouver Sub-Districts 1-18, British Columbia, Canada, Library and Archives of Canada, Ottawa, Ontario; FHL microfilm 2,417,661.